Home » Does exercise intensity affect the susceptibility of resistance trained males to central fatigue? The ability to activate and maintain muscle activation during movement is the one of the many jobs of the central nervous system and a break-down within this system results in motor impairment. A common acute motor impairment from exercise is fatigue which can be described as a reduction in the force output of a muscle. This can occur due to changes at central (within the nervous system) and peripheral (within the muscle) locations. Central fatigue is a reduction in the ability to recruit all available muscle fibres (voluntary activation) and can be assessed by electrically stimulating the motor nerve of a muscle during a maximal contraction. Any addition in force post-stimulation suggests that some motor units were not active and an increase in the size of the ‘twitch’ after a fatiguing task indicates that central fatigue has developed. 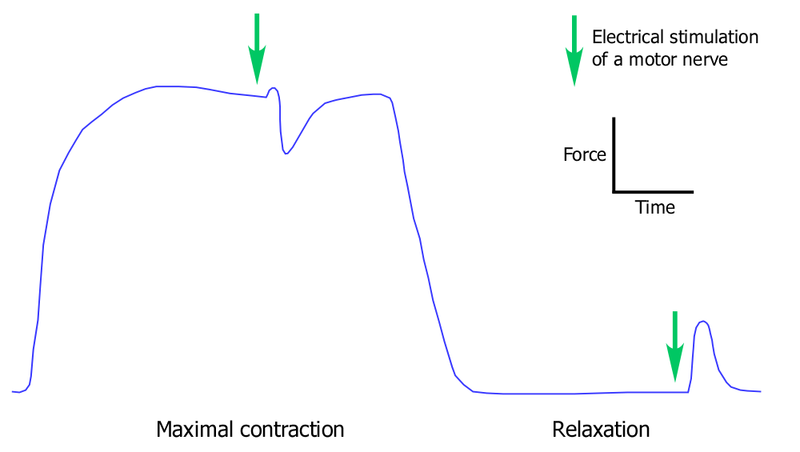 The above figure shows the force of a maximal contraction with electrical stimulation (arrows) applied during the contraction (to elicit a superimposed twitch) and at rest (to elicit a resting twitch). The increase in force after stimulation is used to quantify voluntary activation (voluntary activation = (1 – superimposed twitch/resting twitch) x 100). Resistance trained populations have neuromuscular adaptations that may allow for improved function of the central nervous system during exercise (Aagaard, Simonsen, Andersen, Magnusson, & Dyhre-Poulsen, 2002; del Olmo, Reimunde, Viana, Acero, & Cudeiro, 2006). During resistance training, a common variable that is manipulated is intensity, which refers to the relative percent of the load to a single maximal effort (the most you could lift once). The choice of training at either a low or high intensity is important as it may affect the long term benefits from resistance training with greater strength developed with high intensity training (Schoenfeld, Peterson, Ogborn, Contreras, & Sonmez, 2015). During a single session, exercise intensity will affect muscle activation, volume of work and time under load, which together will influence the ratio of central and peripheral fatigue developed. Previously, central fatigue has been demonstrated during fatiguing knee exercise in recreationally active populations (Christian, Bishop, Billaut, & Girard, 2014; Rossman & Garten, 2014). Because of the adaptations seen in trained populations, and the influence of intensity on the development of central and peripheral fatigue, we explored the susceptibility of resistance trained males to central and peripheral fatigue at different intensities of exercise. We tested the participants after fatiguing isometric knee extension contractions at 80% and 40% of maximal strength on separate days. On each day, maximal force and voluntary activation were measured repeatedly after increasing volumes of work until the participants could no longer perform the 80% or 40% contractions. We expected central fatigue to occur as peripheral fatigue and volume of work increased. We found that in resistance trained males there was no reduction in central motor output after high or low intensity contractions despite large amounts of peripheral fatigue particularly after the low intensity protocol. The low intensity protocol resulted in greater peripheral fatigue, reduction in maximal strength and reduction in rate of force development than the high intensity protocol. Our finding of maintained central motor output, signified by a maintenance of voluntary activation and EMG, during maximal contractions contrasts to previous evidence where declines in central motor output were observed following fatiguing knee extensor exercise (Christian et al., 2014; Rossman & Garten, 2014). We found no central fatigue even though our protocols led to between 10 to 40% more peripheral fatigue than previous studies. We believe that this is best explained by neuromuscular adaptations that accompany long-term resistance training. Resistance trained males were able to maintain central motor output despite high levels of peripheral fatigue. This suggests that previous resistance training may result in a reduced susceptibility to central fatigue. An ability to maintain central motor output in the presence of fatigue would be important during strenuous tasks and physical therapy.